Dundee United manager Mixu Paatelainen expects the battle to avoid relegation to last until the season's final game. United trail Kilmarnock by five points with six games left for play in the quest to remain in the Premiership. "I think it will be tough and I think it will go right down to the wire," said the United manager. 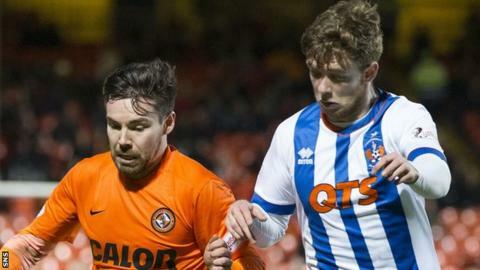 "We do know that Kilmarnock will lose, Kilmarnock will win and they will probably draw. We just need to win more than them in order to survive." Paatelainen thinks his side can still overtake Kilmarnock even if the gap remains the same after the Ayrshire side host St Johnstone as Inverness Caledonian Thistle visit Tannadice on Saturday. There will be five games left as the Premiership splits into two sections of six teams and the United manager does not rule out Hamilton Academical, who are four points ahead of Kilmarnock, being drawn into the relegation battle. "It is still a comfortable cushion Kilmarnock have, but there is still a long way to go with plenty of points at stake," he said. "We have certainly given ourselves a chance. "It depends on how the teams above us do. If they win all their matches, it will be very difficult for us, impossible for us. "A lot can happen in those five matches. You play one another and play against teams pretty close to you and it will be a very interesting end to the season." United were 13 points adrift at one stage, so Paatelainen was not too downhearted about the midweek defeat by Partick Thistle. "We've been playing well, but we haven't been winning enough for our liking," he said. "We need to find more of that consistency in order to survive. "I think our players have shown tremendous character not to give up, not to put the tools away, keep believing. "That's why the gap is down to five points and that gives us hope." One thing Paatelainen is sure of is that Kilmarnock will at some point secure their first win since Lee Clark took over as manager from Gary Locke. "Look at their squad," he stressed. "Some excellent players and they have a manager whose been around, who knows the score, he knows the game. "They will win. They've got goalscorers and solid defenders and very energetic midfielders."